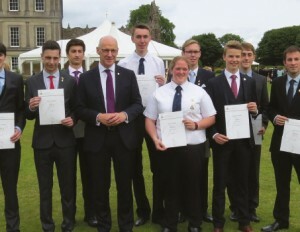 BB young people have been presented with Gold Duke of Edinburgh Award certificates at a special ceremony at the Palace of Holyroodhouse in Edinburgh on 6th July. HRH Prince Edward, The Earl of Wessex, gave the Royal seal of approval to the nine young people and spoke to them ahead of the awards ceremony. John Swinney MSP, Deputy First Minister of Scotland and Cabinet Secretary for Education and Skills, presented the certificates. There was also a special presentation to BB officer, Alistair Whitelaw, who received a long service award. Alistair has dedicated over five decades to leading the DofE programme with members of 1st Lenzie Company.